Favorite Girl has been very curious about all the media hoopla regarding “Black Friday” and, since we’ve never gone shopping on the day after Thanksgiving, we got up at 5:15 am in order to give it a try. My intent was more for people-watching and the experience, rather then actually shopping. I was shocked at the number of people out so early. As we drove past Wal-Mart, I noticed EVERY parking spot was taken. 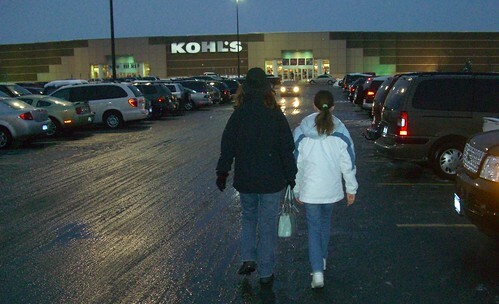 Our first stop was at Kohls and, as I walked in, I noticed the extremely long lines at the check-out. So we poked around, didn’t see anything we couldn’t live without and left. Next stop was Panera Bread for breakfast. We went to the mall, picked up a couple things, then came home to take a nap. After all was said and done, once was enough for me. It’s back to sitting next to the fireplace with the TV on and shopping on-line. Did anyone else brave the early morning craziness? I didn’t go this year, have in the past, but as Jean mentioned, it’s not worth it! Now my neighbor did go, she hit Walmart at 5 am & said it was a zoo, whereas Target was well organized. They asked at the door what you were looking for & handed you a ticket to get one. (She was looking for the XBox360) Once tickets were gone they let people know they were out of that item. I think she’s crossing Walmart off the list for next year! I haven’t been out on Black Friday for years. I would prefer to sleep in and not have to worry about being knocked down in the stampede! There is nothing I need that bad to make me get up that early in the morning, fight for a parking spot, and wait forever in line to pay. We have come to an agreement in our family….less is more. I’ve done the early morning thing a couple of times in the past and prefer not to fight the crowds. Willem and I did venture into Target and Old Navy later in the morning and breezed through with no lines, but had to wait for a shopping cart at Target. Got what I needed and finished up online! I love the internet and free shipping! We went to Target and it was crazy. But I love going out early Black Friday morning – it’s kind of a tradition. I went with my mother-in-law this year, and it was her first time. We had a blast, and I shopped via phone with my sister who was up and out in NC. It’s all part of the holiday season for me! I tried Black Friday last year and that was enough for me. This year I went out at 2:00 PM.